There’s a lot going on in the world now and it’s easy to forget what we are thankful for as we reflect on this Thanksgiving. Your top-rated Kirkwood, MO, orthodontist is most thankful for you, your business and your trust as we work with you to make your smiles the best they can possibly be. We understand that you have a lot of options when it comes to you and your family’s orthodontic needs, and we value our relationship with you as we work together. No matter your age, you might be using or looking at options for orthodontic care, and we are happy to review your options. There are always new advances in treatment, and we pride ourselves on being able to take advantage of them whenever possible on your behalf. We can now improve your smile with traditional metal braces, lingual braces (behind the teeth! ), or clear braces, and your Kirkwood, MO, orthodontist will take special care to tailor your treatment to your very specific needs. Other options include clear aligner systems like Invisalign®, which are practically invisible. They can be removed for brushing, flossing, and eating. They also address most tooth issues that metal braces do and are useful for closing spaces, resolving crowded teeth, and correcting overbites or underbites. New advances come all the time, and we are always on top of them to most benefit you and your smiles. Orthodontic improvement is not always just for young people. Healthy tooth alignment also helps stave off excessive plaque buildup that might come with misaligned teeth, leading to gum disease or other health issues later on that might be preventable. Your orthodontist in Kirkwood, MO, is here for you whatever your orthodontic goals might be! We all have so many things to be thankful for on this holiday, and among them is that you or your family members will soon have a healthy and more confident smile! We are honored and thankful that you chose us to take this journey with you. We look forward to seeing you again soon! 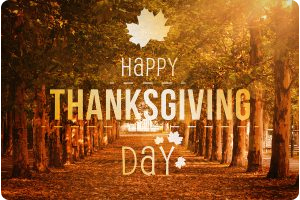 Happy Thanksgiving from your Borello Orthodontics team! P.S. – After you finish your turkey, please remember to brush and clean your appliances! This information is not meant as medical advice. It is provided solely for education. Our Kirkwood orthodontics office would be pleased to discuss your unique circumstances and needs as they relate to these topics.